Sao Paulo is known for museums, shopping, parks, nightlife, and historic sites. Your plan includes some of its best attractions: stroll through Ibirapuera Park, admire the masterpieces at Museu de Arte de Sao Paulo Assis Chateaubriand - MASP, see the interesting displays at Museu de Arte Brasileira - FAAP, and stop by Galeria Arte Brasileira. To find ratings, traveler tips, and other tourist information, use the Sao Paulo trip planner. Use the Route module to find suitable travel options from your home destination to Sao Paulo. In April, plan for daily highs up to 30°C, and evening lows to 20°C. Wrap up your sightseeing on the 20th (Sat) to allow time to travel to Foz do Iguacu. 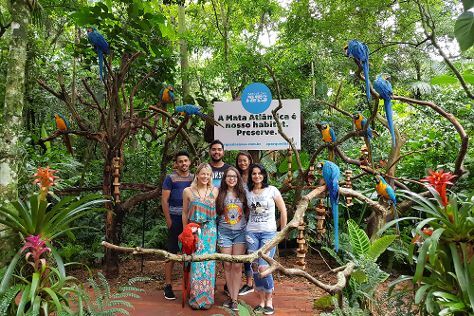 On the 21st (Sun), see human ingenuity at work at Itaipu Hydroelectric Dam, take in the spiritual surroundings of Buddhist Temple, and then admire nature's wide array of creatures at Parque das Aves Bird Park. On the next day, examine the collection at Dreamland Foz and then take in the dramatic scenery at Iguazu Falls. For maps, where to stay, other places to visit, and tourist information, read Foz do Iguacu road trip planning site . Traveling by flight from Sao Paulo to Foz do Iguacu takes 4 hours. Alternatively, you can do a combination of bus and flight; or drive. In April in Foz do Iguacu, expect temperatures between 32°C during the day and 20°C at night. Finish your sightseeing early on the 22nd (Mon) to allow enough time to travel back home.